08/03/2012 - Cities are ready to lead efforts to green the economy, concluded participants of the OECD Roundtable of Mayors and Ministers meeting in Chicago on March 8th, 2012. The Roundtable noted that cities can deliver global solutions to social, economic and environmental challenges and that they must be an integral part of international efforts to make our economies more sustainable. “The world’s future is increasingly an urban future. From New York to Lagos, and from Mexico City to Hong Kong, cities around the globe are taking the lead in making our world healthier, more energy efficient, less congested, less polluted, and less endangered by climate change effects. What cities do, individually and in unison, increasingly sets the agenda for the entire world,” said Mayor of New York Michael Bloomberg and Chairman of the C40 Cities Climate Leadership Group. The Mayors and Ministers agreed that cities should be empowered to take the lead on green growth, but noted that their efforts are hampered by huge investment needs and severely constrained public finances. Cities are truly facing a double challenge: to green existing urban finance and to develop new financing mechanisms. 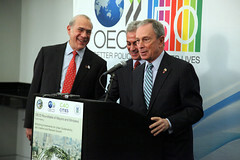 8 March 2012 - (Right/Left) Angel Gurría, Secretary-General of the OECD, Rahm Emanuel Mayor of Chicago and Michael Bloomberg, Mayor of NYC announcing the New C40 Initiative. "The City of Chicago welcomes the opportunity to develop new solutions to the most pressing sustainable infrastructure problems facing cities around the world," said Mayor of Chicago Rahm Emanuel. "During my time in office I have focused heavily on how strategic infrastructure investments can build a stronger foundation for job creation, economic growth and sustainable development, and I look forward to continuing this important work." During the one-day meeting, Roundtable participants shared their experiences on how to use existing resources more effectively and how to tap into new funding, such as carbon and structured finance, user and developer fees, and other private sources of finance. They noted, too, that cities should work together to develop expertise about arrangements for public-private partnerships. Based on international best practices, Roundtable participants concluded that introducing green incentives into municipal revenue systems would be a big step towards more sustainable growth. For example, congestion charges differentiated according to peak hours or the level of congestion can help reduce traffic and pollution, while fees for water and waste services should be more responsive to actual resources used. Participants in the Roundtable acknowledged that effective city-level action is easiest to achieve when there is a sound framework at the national level and good coordination between different levels of government. “President Obama’s economic and community development initiatives such as Choice Neighborhoods and Sustainable Communities, make crystal clear that inter-governmental collaboration is critical for the job growth and sustainable economic development that will power our future,” said US Housing and Urban Development Secretary Shaun Donovan. While there is no “one-size-fits-all” model for implementing urban sustainability, Mayors and Ministers identified a number of common principles and key policy areas where cities should work together and share their experiences. They adopted a Chicago Proposal for Financing Sustainable Cities, which is available on the Roundtable website along with the Chairs’ Communiqué and the issues paper prepared for the meeting (www.oecd.org/urban/roundtable). About the Roundtable of Mayors and Ministers: The OECD Roundtable of Mayors and Ministers is the only global forum that brings together local and national government officials to improve urban policy. Established in 2007, the Roundtable provides a unique opportunity for Mayors and Ministers to discuss urban problems from two very different perspectives, and to find out how they can complement each other’s efforts. About the C40 Cities Leadership Group: The C40 Cities Climate Leadership Group (C40) is a network of large cities from around the world committed to implementing meaningful and sustainable climate-related actions locally that will help address climate change globally. Created in 2005, the organization forged a partnership in 2006 with the Cities program of former President Bill Clinton’s Climate Initiative (CCI). It has advanced programs and partnerships that have drawn international recognition for the role of cities as leaders in climate action. C40 was further strengthened in 2011 via a grant from Bloomberg Philanthropies and the full integration of the CCI Cities Program. About the U.S. Department of Housing and Urban Development (HUD): HUD’s mission is to create strong, sustainable, inclusive communities and quality affordable homes for all. HUD is working to strengthen the housing market to bolster the economy and protect consumers; meet the need for quality affordable rental homes: utilize housing as a platform for improving quality of life; build inclusive and sustainable communities free from discrimination; and transform the way HUD does business.